PM Netanyahu visits Jerusalem exhibit currently being presented at the UN building in New York. "This exhibit shows the truth." 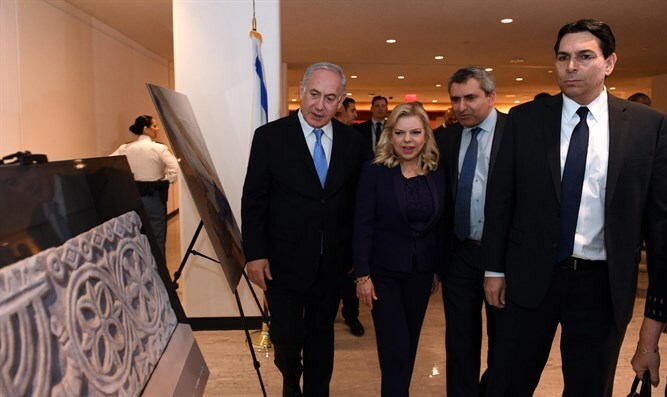 Prime Minister Binyamin Netanyahu and his wife Sarah, along with Jerusalem Affairs and Heritage Minister Ze’ev Elkin (Likud) and Israeli Ambassador to the UN Danny Danon, on Thursday visited the Jerusalem exhibit currently being presented at the UN building in New York. The exhibit presents 3,000 years of Jewish contiguity in Jerusalem. It includes original archaeological finds that were discovered in Israel and which underscore the continuous link of the Jewish People to Israel and Jerusalem in various periods. Among the items that were specially brought for the exhibit are a First Temple-era seal that mentions the "governor of the city" that was discovered earlier this year and an impression of the seal of King Hezekiah. “What this exhibit does is put the truth forward. And I saw a sign right at the entrance there. It says: 'This doesn't represent the United Nations'. I have two comments on that. The first is: Of course it doesn't represent the United Nations, it represent the truth. And we'll continue to tell the truth and speak the truth everywhere, including in the United Nations,” he added. “We also fight for security. I've had remarkable meetings in this week with the President of the United States; with the leaders of Congress: the Senate and the House, Republicans and Democrats alike; with a wonderful crowd at AIPAC – 18,000 strong; with 500 business leaders – I had a very simple message for them – invest in Israel, it's the future; and I've had a wonderful meeting just now with Ambassador Nikki Haley. We call her 'Hurricane Haley'. She does magnificent work for the truth and for the defense of Israel here at the UN,” Netanyahu said. “While we fight for our security, we remember our rights. There is no better place to see our rights and truth than right here in the hall of the United Nations where we speak the truth and where we speak about the justice of Jerusalem,” the prime minister said. “I want to thank you all, thank you for standing up for the truth, for standing up with Israel," he concluded. Minister Elkin added, "I am pleased that we have succeeded in showing – here at the UN – the unvarnished truth. The Jewish People's more than 3,000 years of history in Jerusalem will not be gainsaid by any ridiculous UN decision. Our message here is both strong and clear. We were here over 3,000 years ago and we will be here for another 3,000 years. We will continue to struggle for the international standing of Jerusalem in the framework of our international plan at the Jerusalem Affairs and Heritage Ministry."